One of the reasons why the blooming of the cherry blossoms causes such a fervor is because their blooming period is so brief. Around 3 weeks in early spring is about the only window of opportunity to see these white and pink blossoms and even that briefest of period is often cut further down by outside factors such as sudden drops in temperature, rain, wind, etc. Within this limited time, people show up annually by the thousands to popular cherry blossom viewing sites all around Korea to take pictures, enjoy picnics, and such. But how did this popular activity come to take place in Korea? What are some less crowded places to see the blossoms? Find out more after the jump. 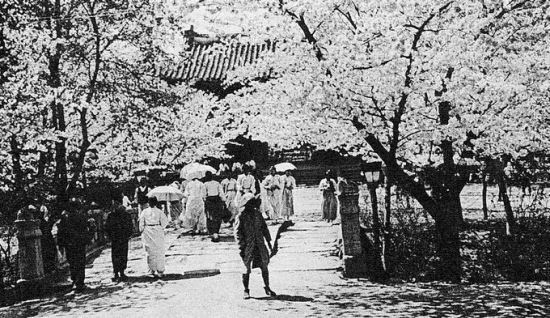 Even in the Joseon Dynasty, records of cherry blossom trees can be found such as when it was written that King Hyojong ordered additional planting of the trees as its wood was used for making arrow shafts. There are also records from European missionaries and scientists in the early 1900s who noted the trees being found around Mt. Halla in Jeju. While the trees were found around Korea, the act of coalescing them didn't come about so frequently until the Japanese colonial era. During this time, the Japanese authorities had begun trying to erase and dismantle both historical and cultural elements of Korean society including the royal palaces. Changgyeonggung, one of the five royal palaces, was one of the most affected palaces of this era's cultural erasure policies as this former favorite royal residential grounds was converted by the Japanese into a zoo and public park (later renamed Changgyeongwon). 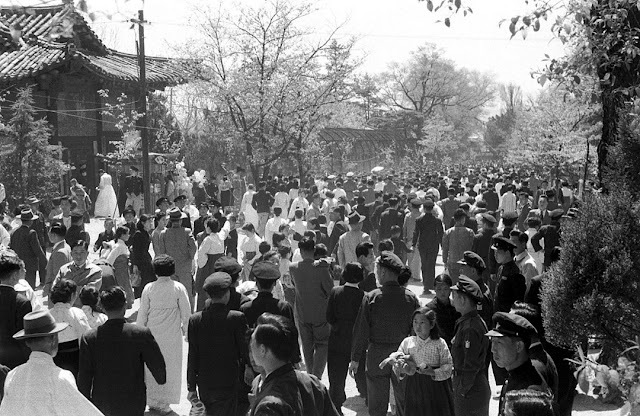 At the same time, as the voices and actions of Korea's independence fighters grew louder, the Japanese authorities took several actions to try and "distract" Koreans from the growing movement including a systematic planting of cherry blossom trees in Changgyeongwon for cherry blossom viewing. Thus Changgyeongwon, and not Yeouido, was originally the most famous spot in Seoul for the annual spring blooming which many of Seoul's older residents will recollect. Fast forward to the 80s and efforts to restore Changgyeongwon back to its status as a royal palace led to most of the cherry blossom trees being relocated to Seoul Grand Park and in Yeouido (near the National Assembly Building) where they've now become some of Seoul's most popular and recognized cherry blossom viewing sites. Outside of Seoul, many current popular cherry blossom tree groves also stems from Japanese colonial occupation such as in the early 1900s in Jinhae when many of the trees were planted in the popular Japanese naval port town. Later on in the 60's, President Park Chung Hee, an avid admirer of Japanese culture, was said to have a fondness for the trees and ordered their planting in many locations in the Korean peninsula. Thus the fact remains that the surge and growth of the cherry blossom trees in Korea- both in numbers and in cultural significance- does largely stem from the colonial occupational era. This fact is important for not only visitors to Korea but particularly Koreans themselves to know and that although the blossoms do possess an undeniable aesthetic element to them, that they are rooted in beds of bittersweet truths. Still, it's no fault of the trees themselves for being what they are so, without forgetting the past, what are some popular places to view the trees in present day? The undeniable, most popular spot for cherry blossom viewing in Seoul is in Yeouido where the rows of blossoms next to the National Assembly Building, just by the Han River, does make for a picturesque setting. That is, if it isn't for the throngs of crowds comprised of visitors, various food and event carts, and stalls that set up everywhere. Even with the car lanes around often closed off during the weekends, it gets crowded fast. If you want to come here to view the blossoms, it's strongly recommended you do so on a weekday, particularly in the mornings, when crowds are at their minimum. Other well known cherry blossom festivals include around Seokchon Lake (in Jamsil) and in Seoul Land. Seokchon Lake also fills up pretty fast during weekends while Seoul Land has such a large land size that even on weekends it doesn't feel as dense with people than other spots. The downside of Seoul Land is that it actually lies just south of Seoul which is accessible by public transportation (via Seoul Grand Park station on subway line 4) but considerably further and more difficult to get to than Seokchon Lake which is situated right in eastern Seoul. If you prefer quieter settings with fewer people areas like Yangjae Stream, within Namsan Park, and Seoul Forest are great options. The cherry blossoms may not be as many as Yeouido or Seokchon but they are still significantly there. Naksan Park, near the Ehwa Art Village, also holds a few cherry blossom trees scattered about. The National Cemetery of Korea also holds quite a few trees however, as it is a national cemetery, this is not the one you want to go for frolicking as it is expected that all visitors be quiet out of respect to those interred there. Outside of Seoul, around the Gyeonggi Province, popular cherry blossom viewing spots include in Goyang (Ilsan)'s Lake Park, Yongin's Everland Park near the Hoam Art Museum, in Seongnam's Jungang Park, Suwon near the Gyeonggido Provincial Building, along the Anyang Stream, Gapyeong's Sangcheonli cherry blossom road. Of course, the trees aren't restricted only to Seoul and the surrounding Gyeonggi Province and you can follow the link below to see some of the most amazing spring flower blooms I've ever witnessed in places like Hadong and Tongyeong. Pack a good camera as everyone is going to be snapping away and posting on their Instagrams all around you. Please enjoy the blossoms with your eyes only. Breaking off branches or even flowers is not recommended though if you want to pick up a flower that's fallen naturally to the ground, that's all on you. As mentioned above, determining the time and where you choose to enjoy the flowers will make a big difference in your level of enjoyment. For the extremely popular locations try and avoid weekends, especially afternoons. Note that the popular spots, like Yeouido, will have extremely limited parking and the subway stations can get pretty packed as well. Like with almost any Korean activity, food isn't left out. Picnicking under, or near, the blossoms has been a favorite past time for decades though it's not always an option such as in Yeouido where it’s mostly streets and people with no space. Vast park grounds like Seoul Land and Seokchon Lake are ideal for picnicking but try and get there earlier if you want the best spots. In picnicking, it's popular to pack picnic "boxes" stuffed with finger foods like kimbap, yubuchobap, fruit, vegetables, etc. If you're not much of a cook you're in luck as convenience stores sell a wide variety of different kinds of meal sets and snacks that are available to go. If you're feeling fancy, department stores will also sell premium meal sets that look just as pretty as they taste. Department stores and larger grocery markets are also good choices if you're looking to pick up bread, cheese, fruits, cold cuts, etc for a more Western-style picnic. Be on the lookout around this time for various limited edition “cherry blossom” snacks and beverages. 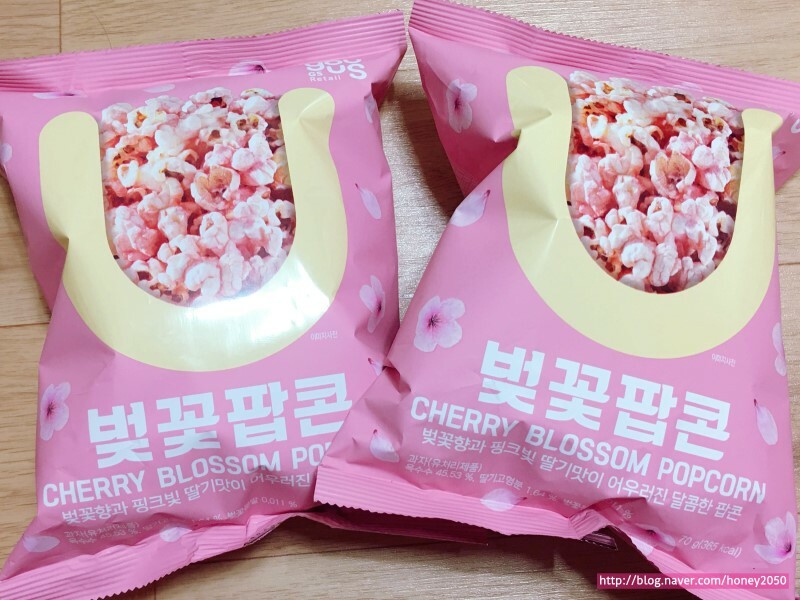 This is when everything from chips to even beer products will come out in cherry blossom flavors in which case usually it means it’s some shade of pink and with some added flavors. Ask anyone what cherry blossom flavor tastes like and you’ll get a shrug as cherry blossoms don’t have a scent in general. But you can’t blame the companies for trying to market off this time! Don't forget that you can always also order delivery from the many franchise eateries around although this isn't a recommended option for extremely crowded areas as the logistics of you finding your delivery person (and vice versa) will likely be a nightmare. If you're planning to have a picnic make sure to bring necessary equipment such as blankets for sitting on. Don't bring any portable stoves or open fire cooking equipment as these are not allowed. Spring is, unfortunately, often when both yellow dust and micro dust levels can get bad so check the air quality before you decide if you're going to stay outdoors for a long period of time. Temperatures between day and night time can fluctuate quite a bit in early spring so bring layers if you're sensitive to the weather and climate. For information about 2018's various flower festivals around Seoul and also around Korea, check out the Visit Seoul and Visit Korea page. And with that, enjoy!